It’s 8:17 in the morning. You are rushing through the crowd of people on the platform to get onto that train before the doors slam close, and you are oh so grateful that the boiling hot cup of coffee you are cradling like a rugby ball has a sealed plastic lid on it, saving you and your fellow travelers from a splattering of 2nd degree burns. But once safe in the moving train, with coffee ready to be consumed, things start to get messy. You tear and peel the un-perforated plastic lid to reveal a jagged drink-hole, dousing your fingers with the hot, sticky liquid in process. the torn plastic flap will inevitably refuse to secure itself to the corresponding notch in the lid, condemning you to an awkward coffee-covered tab of plastic bumping you in the nose with every sip. My morning coffee-drinking experience (which I treasure deeply) is consistently thwarted by these stupidly designed coffee cup lids. Design innovation surrounding the little things in life sometimes seems to become unnecessarily stagnant. 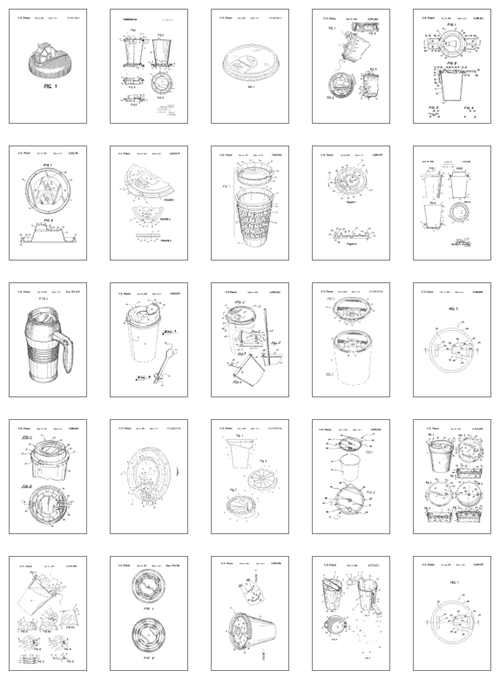 My morning coffee frustrations pushed me to do a little research (and in the process realize how amazing Google Patent Search is). 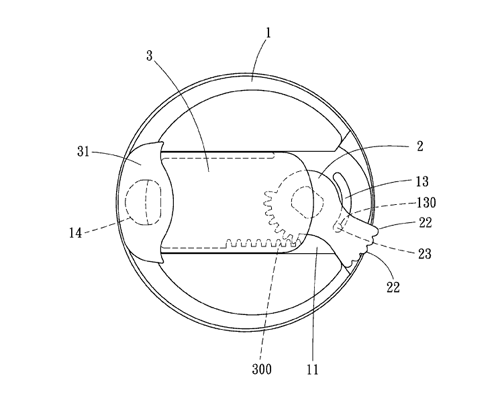 This coffee lid exploration turned into little more than a rant, but if nothing else, it dug up some interesting patent illustrations for a seemingly mundane invention that actually affects lots of us every day. 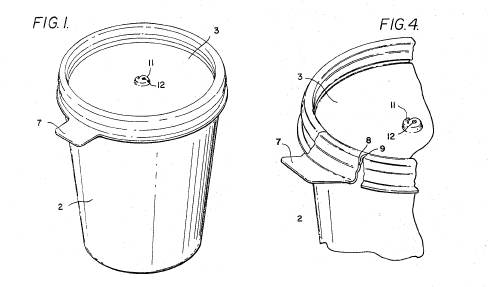 The oldest tearable lid design I could find brings us back to 1967, with a patent filed by Alan Frank of Pittsburgh, PA. Thank you, Alan Frank, for solving the first half of my morning coffee equation; the coffee wont spill while I’m in transit. 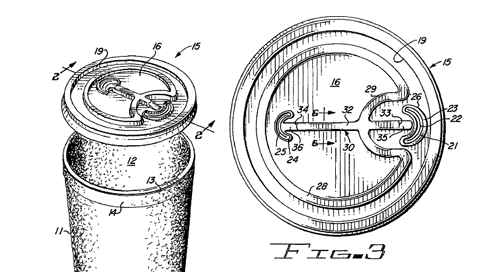 It took another 8 years before our next major innovation hit the books in 1975, with Walter Elfert and James Scruggs’ design for a fold-back tab that could attach itself to the lid and remain out of the drinker’s way by sliding the end of the tab into a small incision on the lid. Let me stop and point out that this idea of peeling back a lid, and attaching it out of the drinker’s way has existed for about 35 years. There is no reason why this problem shouldn’t be ’solved’ by now. 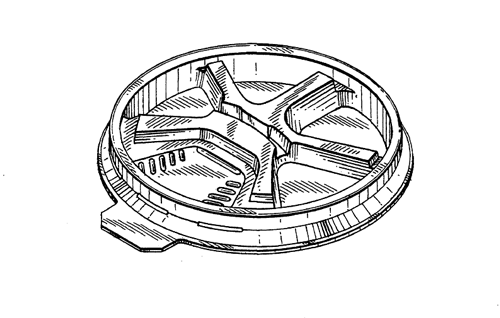 1977 saw the first iteration of the “snap” closure design by Kenneth Jay Albert, by which the plastic tab snaps into a counter-shaped recession on the cup’s lid. This actually seems to be the legacy feature that often proves to be the culprit of most modern day malfunctions. While I’m not questioning the effectiveness of Albert’s ’snap’ system, it evolved (or devolved) over the course of the next two decades into something that looks closer to what we often see now, first introduced by Hugh Van Melle in 1995. Despite dozens of new peel-back snap closure designs being introduced through the 1980s and into the 1990s, I would guess in an effort to reduce production cost, the snap closure design appears to have been stripped down to a point where it frequently stops working for the end user. 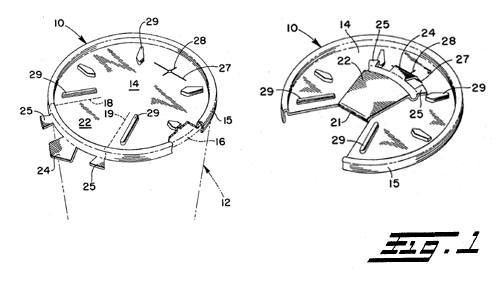 The sad part is that coffee cup lid innovation has progressed over the past couple of decades. Opting for independent espresso houses rather than the big chains (ironically, Dunkin’ Donuts has great cup lips, too bad they can’t offer coffee that matches their lid quality), 9 times out of 10 I am still somehow stuck with a lid that doesn’t work. 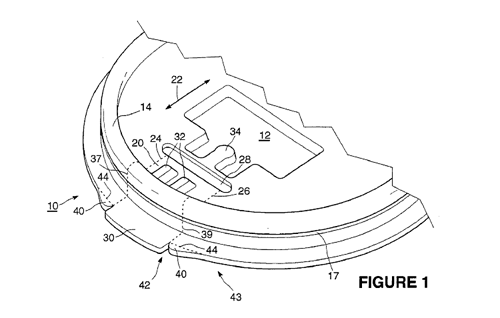 A search through Google Patents for “Cup Lid” will return hundreds of inventions in the field. Why has the market not driven the cream to the top? (yes, terrible pun). You would think that businesses that take pride in the coffee that they serve would want to invest in optimizing their customers’ full coffee experience. The past few years have seen new novel ideas proposed, like Taiwanese inventor Ching Yueh Wang Wu ’s open/close switch design. Of course introducing more than one piece into the molding process undoubtedly adds, I don’t know, maybe pennies to final cost of each unit. As long as it’s recyclable plastic (or better yet,biodegradable), I don’t mind taking on that extra cost as the consumer. The functionality of my lid really can make or break my coffee drinking experience. ‘User Experience Design’ is a discipline that has arguably existed for as long as human tools have, but now that I’m thinking about user-centered design for web experiences on a daily basis, I am really starting to notice (read: get irrationally frustrated by) a lot more seemingly solvable points of friction within the physical world. I am requesting designers everywhere to uphold their critical gaze, and tell their damn coffee shop to spring for some better lids. Type/Code is an interaction design studio in Brooklyn NY. We design and build things on the web.